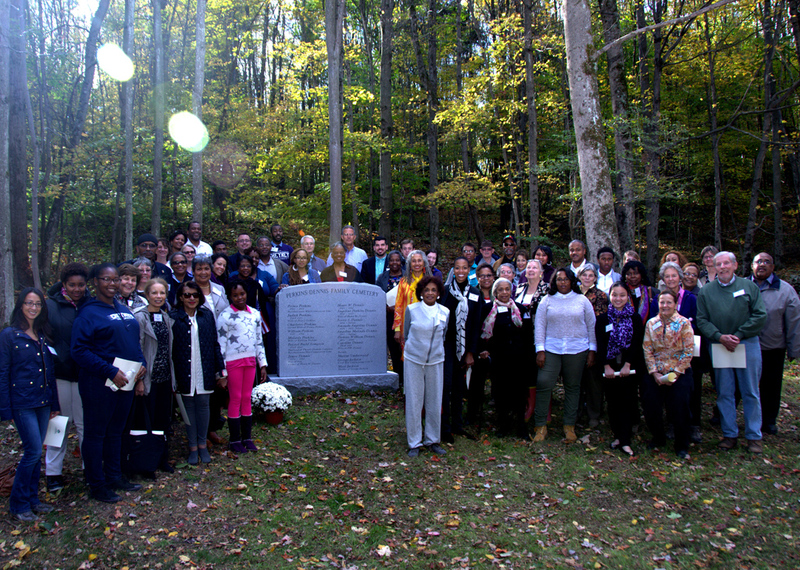 Photo Caption: Guests gather for dedication of monument at Perkins-Dennis Cemetery at 2nd Annual Dennis Farm Symposium. More than eighty guests gathered at Keystone College on a spectacularly beautiful autumn day for the Second Annual Dennis Farm Symposium, October 8, 2014. 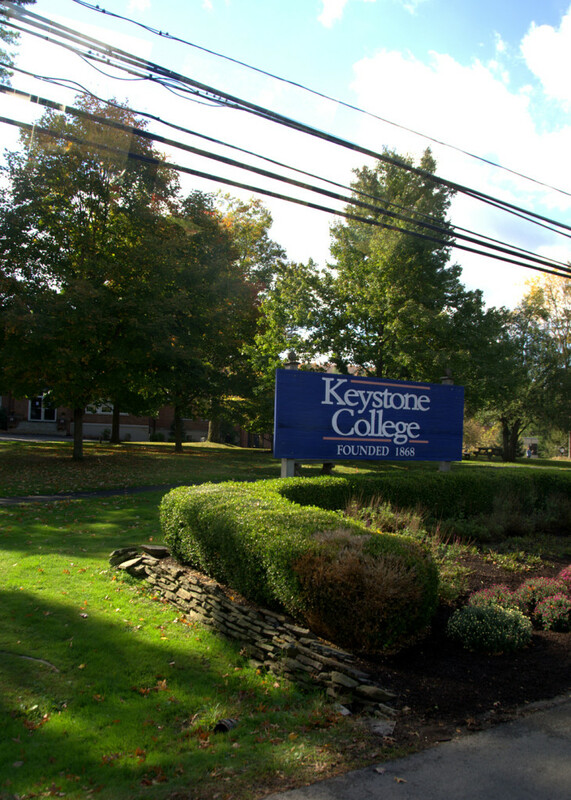 Through the generosity of President David Coppola, PhD, Keystone College hosted the symposium in partnership with DFCLT. The program and luncheon were held in the college’s Brooks Theater, an ideal venue. Keystone staff did a superlative job in preparing for and hosting the event, and their hospitality put everyone at ease. Following the program and luncheon, the symposium guests boarded buses for a short, but scenic ride to the Dennis Farm and the dedication ceremony of a new granite monument at the Perkins-Dennis Cemetery. After the ceremony, guests were free to take a guided tour of the farm. To see more photos from the event click here! The program began with remarks from George Stark of Cabot Oil & Gas, which sponsored the luncheon. Stark introduced President Coppola who gave a warm welcoming address to symposium attendees, which set the tone for the day. DFCLT Board member Wade Catts of John Milner Associates followed President Coppola on the program, presenting a fascinating talk that focused on the Dennis Farm’s unique historical and archaeological significance. Catts also outlined the goals DFCLT achieved in the last year including the construction of the pole barn over the farmhouse, the publication of the 2014 Dennis Farm calendar, and the farm’s listing on National Register of Historic places, among others. The next speaker was Amanda Clerkin, a recent graduate of Penn State, University Park who attended last year’s symposium as part of her PSU landscape architecture seminar. After taking the Fall 2013 seminar that involved working with a team to create a master plan for the Dennis Farm as a heritage site, Amanda was inspired to create a landscape architecture master plan for the Dennis Farm entrance and interpretive center as her Spring 2014 Independent Study. Her plan, featured on the DFCLT website this summer, was so impressive that DFCLT invited her to make a formal presentation at the October symposium. Her thoughtfully planned design provides a real-life, full-color picture and roadmap of DFCLT’s goals for the site. During the luncheon, DFCLT President Denise Dennis presented the symposium’s keynote address, “Read This With Care” Artifacts from the Dennis Farm. The title is taken from an inscription written by Henry W. Dennis, in 1840, inside one the artifacts, a book featured in his great-great granddaughter’s presentation. Dennis’ talk included photographs and commentary about the collection of nineteenth century artifacts that belonged to her ancestors and were passed on to subsequent generations. In addition to books, the collection includes flatware, chairs, reading glasses, handwritten notes and receipts and other items. Each artifact carries one back in time to daily life on the farm.